In the course of decluttering, I came across lots of photos I took during flights on “Bomber” Bob Richardson’s B-17F “Kathleen” and the National Warplane Museum’s B-17G “Fuddy Duddy” many years ago. I never had a large scan of one of the nicer panoramic shots – only the small one in that linked article – so I just scanned one of the 3½x5″ prints at high DPI. 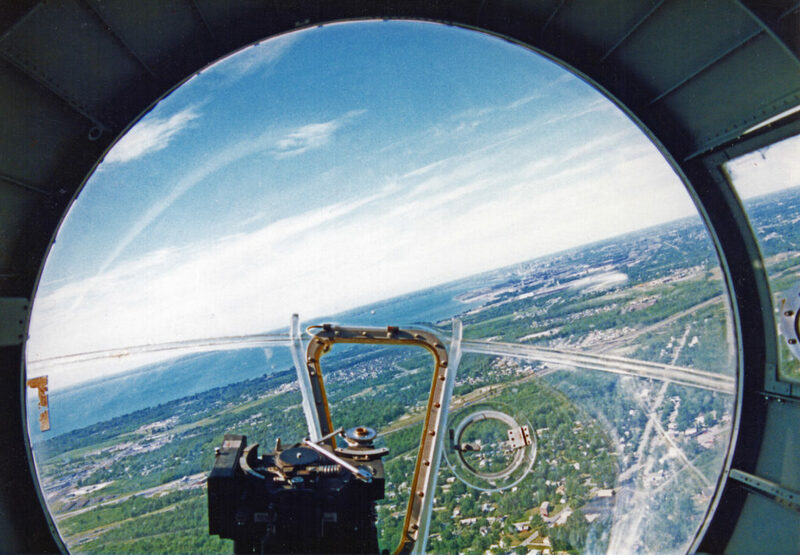 I took this photo from the bombardier’s seat in the nose of the B-17F as we were departing Buffalo Niagara Airport and turning away from Lake Erie on our way back to the museum at Geneseo, New York, 60 miles east. Click on it for a 1920-wide version – then F11 will give you the full effect in most browsers. This entry was posted in Aviation, Boeing B-17, Photography.